HEAT grill to medium heat. Spread tortillas with dressing; sprinkle with chili powder. LAYER half each of the remaining ingredients on half of each tortilla; fold in half. GRILL 2 to 3 min. 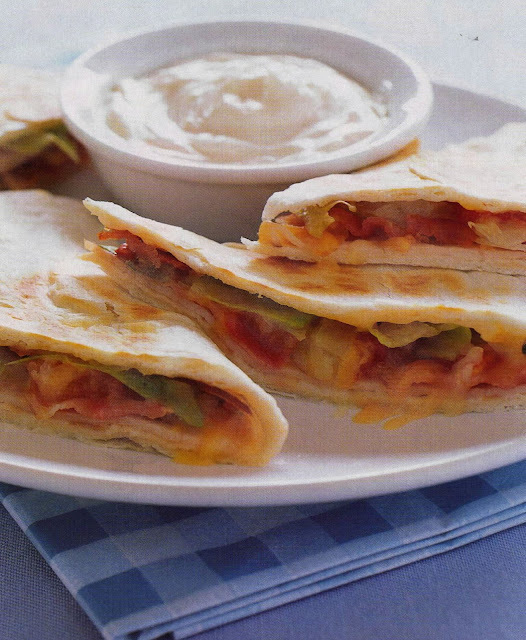 on each side or until quesadillas are golden brown on both sides and Singles are melted. Serve with TACO BELL® HOME ORIGINALS® Thick 'N Chunky Salsa and a small dollop of BREAKSTONE'S or KNUDSEN Sour Cream for dipping. Prepare using OSCAR MAYER Fully Cooked Bacon. Cook quesadilla in nonstick skillet on top of stove instead of on the grill.